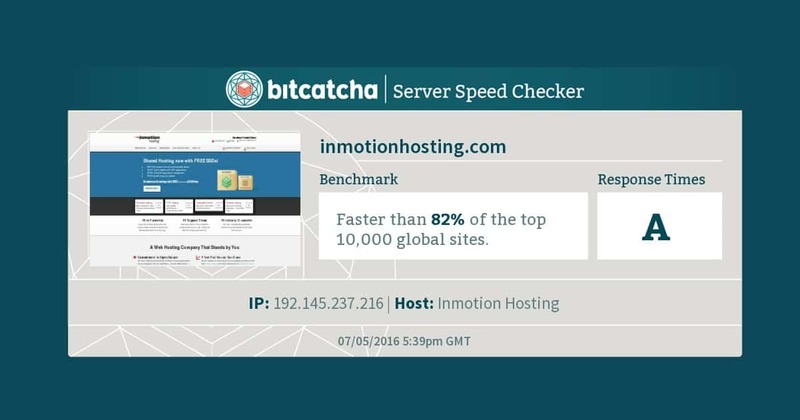 Have you tried Bitcatcha’s speed checker tool yet? I built it to show you exactly how fast your website’s server is performing. Enter your web address and we’ll meet back here when you’ve got your result. You’ll see that we’ve given you lots of data and an overall grade between A+ and E.
Is your website top of the class? If you got an A+, then congratulations. Your website server is faster than Google’s recoomendations of 200 ms. Your web host is doing a fantastic job. If you got a C or lower, there is plenty of room for improvement. If you got a E or lower, there are real problems with your server speed. Last week, I explained the importance of your website load speed. A quick website means more visitors, more customers, and more profit. If your results are slow, your online business could suffer. You’ll also see that we break down the results from eight different global cities. That’s because we ping your website from all over the world. Let’s say you run a business from New York City. Your target audience and core visitors are probably all in the east coast of America. It’s crucial that your server is delivering results fast in this location. You needn’t worry too much if your results from Singapore or Sydney are a little slower. You’re looking for a fast response in your target area. So, what can you do if your results are poor, especially in your target locations? The global network that holds the internet together is never 100% stable. Due to the way that things operate, global networks may be insecure at your particular time of testing. Try again at a few different times and take an average. If you’re consistently getting a poor result, then you know something is wrong with your server. I showed you earlier how your website responds faster in different parts of the world. Well, that’s because your server is located in a particular geographical location. If your results are super-fast in Los Angeles but slow in London, it means your server is located on America’s west coast. Not exactly ideal if your target audience are all in the UK! Contact your webhost and ask them to move your site to a server that’s a little closer to home. Your customers will access it much quicker that way. If you’re getting poor results all over the globe, perhaps you need a different web host altogether. Most of the time, people choose their web hosts for convenience. Or because it’s cheap. They settle for the first service they stumble upon without much thought to its performance. Well, now you know that your web host might be letting you down. That’s where we comes in. We exist to help you find a better web host solution. We want to help you make an informed decision about your hosting service. Measuring your server speed is just one way of showing you whether your current service is right for you and your business. We offer a wealth of web hosting reviews, advice and interviews on the site. We also feature a list of websites hosted with various different companies. You can test their URLs in our speed checker and see how they compare to yours. Your hosting service is the heart of your website. You can’t afford to take chances on it! If you’re looking for quick answers, I use SiteGroundg here at Bitcatcha and I can wholeheartedly recommend the service. It performs flawlessly in every geographical location. Most cheap hosting solutions will house your website on a shared server. Here, your site is sharing the weight of traffic with others and consuming the same resources. It can lead to slow response times and delayed loading speeds. It’s much like a block of apartments all trying to access the same wifi network. There’s a set bandwidth, and everyone’s trying to use it! I use a SiteGround cloud hosting here at Bitcatcha. It provides a better service than shared hosting and is the perfect option for an online businesses. The largest companies on the net use dedicated hosting. In this case, your website would be hosted on its very own server. The bandwidth and resources are used exclusively by your site. You’ll also get a lot more control over the server settings which you can manipulate to allow faster loading. Do check out these managed WordPress hosting If your site is running on WordPress. They are all optimised for speed. A content delivery network (CDN) uses servers dotted all around the world. Your website information will be stored on each of them, so it will serve users based on their geographical location. That means if someone visits your website from Australia, your CDN will serve them content from the closest possible server. With a content delivery system, it doesn’t matter where in the world your site is accessed from, it will always be fast. The two big names in content delivery systems are MaxCDN and Cloudflare. Here at Bitcatcha I use Cloudflare to make sure everyone on the planet has quick access to our site. The ‘Keep Alive’ setting is a secret code within your server itself. Some web hosting companies leave this setting ‘off’ as default. When this setting is off, a new connection to your site must be opened with each new visitor. It’s then closed immediately afterwards. This is like closing the freeway into the city after every car passes through. By turning the ‘Keep Alive’ setting left ‘on’, you’ll keep the freeway open and let everything flow through a single connection. You can enable this code yourself if you have access to the server, or simply ask your web host to turn the setting on. These tricks will work right now. There are other methods too. You can clean up your code, tighten up your design and implement more efficient caching. However, you must start with the server itself. It’s the beating heart of your website and the foundation that everything else is built on. Is your website performing quickly? Test it in the Bitcatcha speed checker now to find out. As always, please share your thoughts, comments and questions below.